Can you possibly tell me how old this might be and exactlly what type of needlework it is. 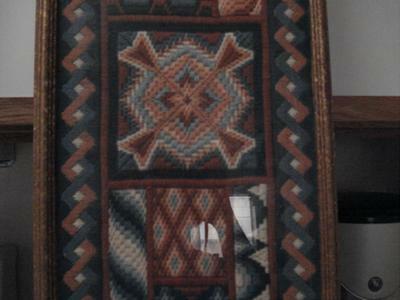 Yes that looks like a Bargello sampler to me. Basically that is various lengthed straight stitches on canvas that make up stunning patterns by the use of graduated colour. I can't help much with the age apart from to say if you know it has been around for some time, it is possible it was stitched back in the 1970's as Bargello went through a revival period back then and is now coming into popularity again. It looks like needlepoint with a variety of patterns. There are some Bargello, satin stitches, and I thought I could see something that looked like Smyrnas or Dove's Eyes too. I can't make a guess at the age without a better examination. Nice piece of work though! From what I can see of the needlework, it looks like it may be in part Bargello.